CompactFlash (CF) Card is a mass storage device format used in portable electronic devices. For storage, CompactFlash typically uses flash memory in a standardized enclosure. The format was first specified and produced by SanDisk in 1994. The physical format is now used for a variety of devices, such as cameras, DSLRs, camcorders, music players, game devices. Due to accidental deletion, pressing the reformat button in camera, or various reasons of damage (e.g. low battery power, turning off on writing/reading), you may have lost your valuable pictures from a CF Card. Do not worry! In most cases, they are still recoverable. 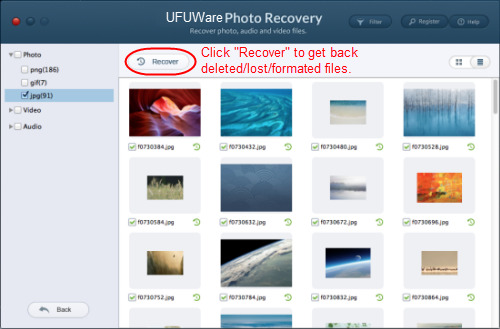 UFUWare Photo Recovery for Mac or Windows is a CF Card Recovery software to recover deleted, reformatted and damaged photos and movies from Compact Flash Card. It uses a wizard-style interface to allow you to easily recover picture and video files from a CF memory card. There are many CompactFlash card brands including SanDisk, Kingston, KingMax, Samsung, Canon etc. Each CF Card manufacturer may have different series. For example, SanDisk has a series of CF cards including Extreme I, II, III, IV, Ultra I, II and Standard. This CF Card Recovery Software supports all CF Card brands and types on the market. 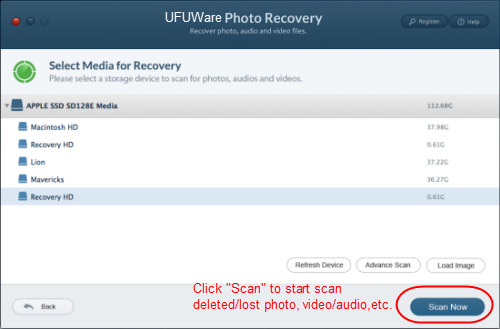 Download the free trial version of UFUWare CF Card Photo Recovery from its official site and install it on your Mac computer. Then connect the CF card to computer via a card reader. Run this photo recovery for Mac. On the drive list, select your Compact Flash card as target drive. Then click the “Start Scan” button to perform full scan of deleted photos on CF card.